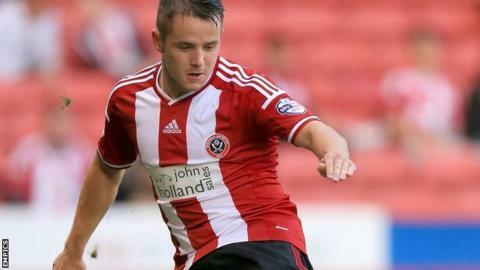 Sheffield United boss Nigel Clough says top scorer Marc McNulty needs to improve his all-round game. The 23-year-old scored for the fourth successive league match in Tuesday's 2-0 win over Yeovil. His goal against the Glovers took the former Livingston man's tally for the season to six goals from seven starts. "I didn't think he played particularly well, especially in the first 10, 15 minutes but he got his poacher's goal," Clough told BBC Radio Sheffield. "That's what he's in the team for but he's got to do more in his all-round game. "He should have caused the centre-halves more trouble and worked the channels more." Tuesday's game was the Scotsman's first start for the Blades since the 2-1 win over Gillingham on 27 September. Meanwhile, Clough is trying to add another loan player before Saturday's trip to Crewe. "Negotiations are ongoing but we're not particularly close at the moment," he said. "He's not a young player from a Premier League club, we're after a little bit more experience."